DomCon NOLA 2017 Oct 5th. - Oct. 8th. Just in case you have not been reading My Tweets lately. I am attending DomCon New Orleans 2017. The event will be Oct. 5th. - 8th. at the Astro Crowne Plaza Hotel in the beautiful French Quarter. This will be My 38th birthday and I will be educating 4 workshops and taking appointments for Live Cash Meets and sessions. 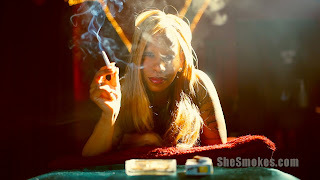 If you are interested in meeting for a session, email Me at mz.desade.fatale@gmail.com . I am only taking booked meets only no same-day arrangements available. May you be Dominate, A switch, slave minded or submissive, there will be a time when one seeks for a long-term dynamic. May it be negotiating play partnerships or collaring, there are needed steps to build the relationship. This presentation will help set up the needed platforms in finding, negotiating and developing a sub / Domme relationship. We will go over knowing when the Dom or sub is right for one’s D/s needs, how to set up perimeters for interaction, rules and limits to define each one’s roles and their placement in a D/s dynamic, and how to develop a relationship that can last for years. Madame Mina De Sade International Rubber Model, Fetish Fashion Anarchist, Educator of the Latex, Rubber, PVC Fashion and Fetish. Madam De Sade Fatale is not just a Fetishist of the non-cloth but a stylist, designer and former educator for Syren Latex and also educates abroad and thru social networks on Latex Fashion, Psychology, Fetish History & CareShe Will share her secrets of grade structure, styles, ranging from fashion wares to heavy duty play wear. Psychology of the mind of the Rubber Fetishes and the difference from a Fashionista Fetishist and a Fetishist of the material in WHOLE! There will be some insight into the power of Latex & Rubber Fashion and the submission for those who cannot live without it! The class will also go over care, how to purchase and well-needed info for those who love the material of tight stretchy confinement!!!! I- Scream @ Sanctuary LAX STUDIOS. August 23rd 2014, starting @8pm. A Southern style Cigar and ice cream social with a bit of a beat and greet. We have a great and eclectic mix of Entertainers . 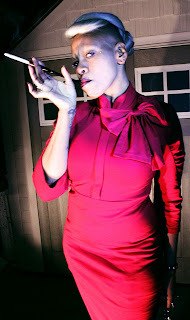 The Event will be Mc'ed by Myself Madam De Sade -Fatale along with Benzo Blackwell and Sir Nik ! 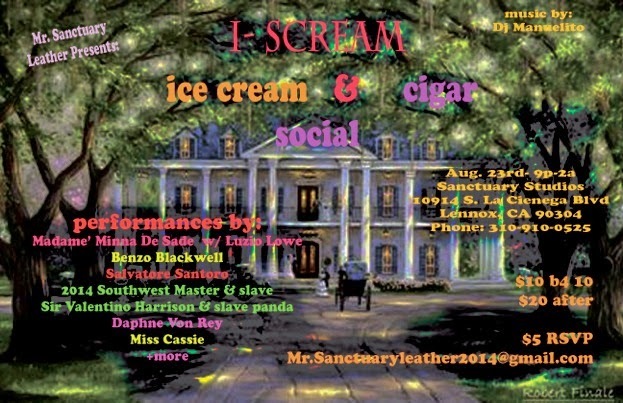 It is going to be fantastic evening of scenes , cigars , souther style drinks and of course ice cream before the scream portion of the night . Madame Mina De Sade @ Montreal Fetish week 2013 ! Check Me out on My nights of Fetish Rubber play and Fashion . Here are the nights I will be shining and playing with all those wanting a Vac bed experience with Mina De Sade Fatale (Rubber Mina) Sadist Rubber Nun . Here is a link to the Festivities below . Workshops , scenes by Madame De Sade w/Switch Miss Claw & P/pup (zig-zag) aka Derrick Paul. (415) 366-6329 or email U/us Madame De Sade-Fatale @ mz.desade.fatale@gmail.com or Miss Claw @ cruelmissclaw@gmail.com . Sanctuary LAX Studios Presents : "Club Indulgence"
Club Debauched : Madame Mina De Sade Hosts the Monthly Play & Dance Club Every 2nd Friday of the Month !! @ Sanctuary LAX Studios . Massad Magazine ( October 2010) for Montreal Fetish Weekend. LA DEAD (Disko Nekro , RUIN Hollywood, Malediction , Mode:M , Warlok ) , Montreal Fetish Weekend , Rubber Doll Revue , Ms. World Rubber , Von Gutenberg Fetish Weekend.